When the draw was made for the third round of the cup, there was a twinge of regret that we hadn’t been drawn away to Burton, as it would have been a new ground. 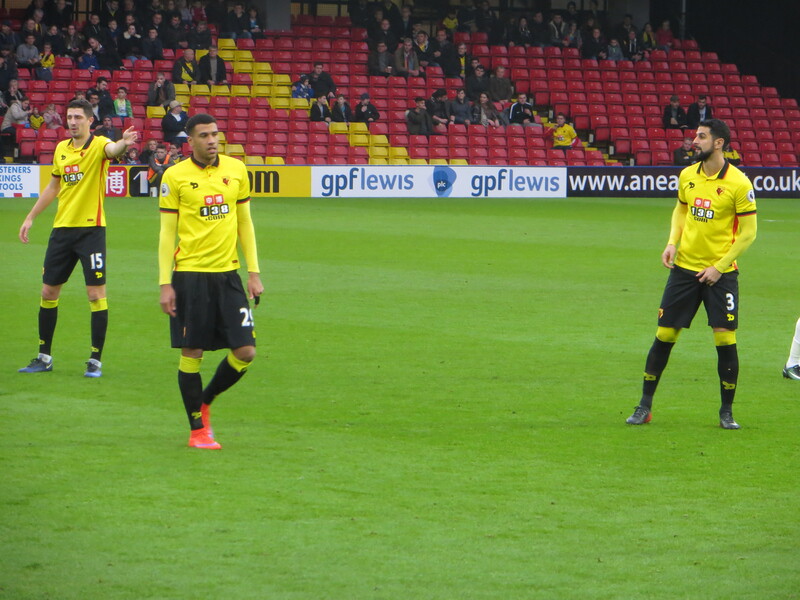 But a Saturday 3pm kick-off at Vicarage Road made a very pleasant change. I arrived at the West Herts just before it opened, in time for the guvnor to open the interior door for Don, offer him his usual (tea with milk and two sugars) and have it delivered to the table before I’d ordered my pint. These celebrities, don’t know they are born. Team news for this game promised to be interesting. Would Walter opt to put out an inexperienced team and rest the remaining first team players or would a better performance and (hopefully) a win be worth risking further injuries? In the event, the only change that wasn’t enforced by injury or illness was the inclusion of Cathcart in place of Prödl (although it is likely that Pantilimon would have made an appearance even if Gomes had been well). It was very pleasing to see Brandon Mason given a start after his substitute appearance against Spurs. The starting line-up was Pantilimon; Kaboul, Cathcart, Britos; Kabasele, Capoue, Doucouré, Mason; Sinclair, Ighalo; Deeney. Former Watford men, Lloyd Dyer and Lee Williamson started for visitors. It was also great to see Ben Watson back on the Watford bench. We had opted for a change of scene for this game, swapping our seats in the Rookery for a place in the SEJ stand. Our seats were low down and right next to the Watford dugout, which was a little distracting while having the extra attraction of a good view of Nigel Clough (for whom I have had a very soft spot for many years). Watford’s first attack of the game came through Mason who beat a defender on the wing to go on a run and put in a cross which was caught by the Burton keeper, McLaughlin. Watford’s injury curse continued as, following a clash of heads with Britos, Cathcart was unable to continue and, with only a quarter of an hour on the clock, was replaced by Prödl. Being close to the dugout, so we got to see first-hand the time taken to prepare the top knot (which isn’t meant as criticism, I find it rather fetching and it was done while he was receiving instructions). Burton threatened with a cross from Dyer, but it was an easy catch for Pantilimon. Watford took the lead through a lovely move as Mason played a one-two with Deeney before putting in a terrific cross that Kabasele stabbed home. I think that the goal calmed a lot of nerves both on and off the pitch. 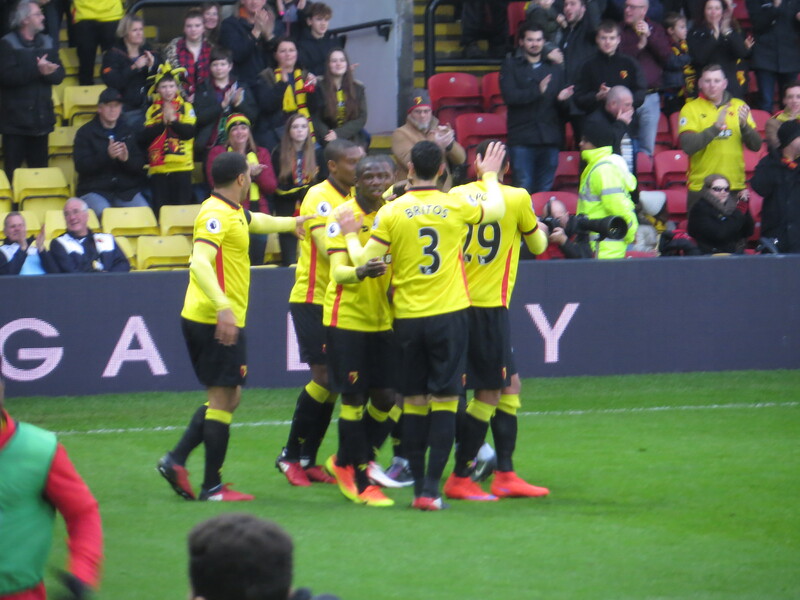 Watford had a decent chance to increase the lead as Capoue played a through ball to Ighalo who played a quick one-two with Deeney before executing a trademark scoop and shooting just over the bar. Burton had to make a substitution just after the half hour mark as Ward replaced the injured Miller. The visitors had a great chance to equalize just before half time as a cross was punched to Ward on the edge of the box but Capoue was on hand to block the shot. The Frenchman then went on a counter attack ending with a low shot that was saved by McLaughlin. 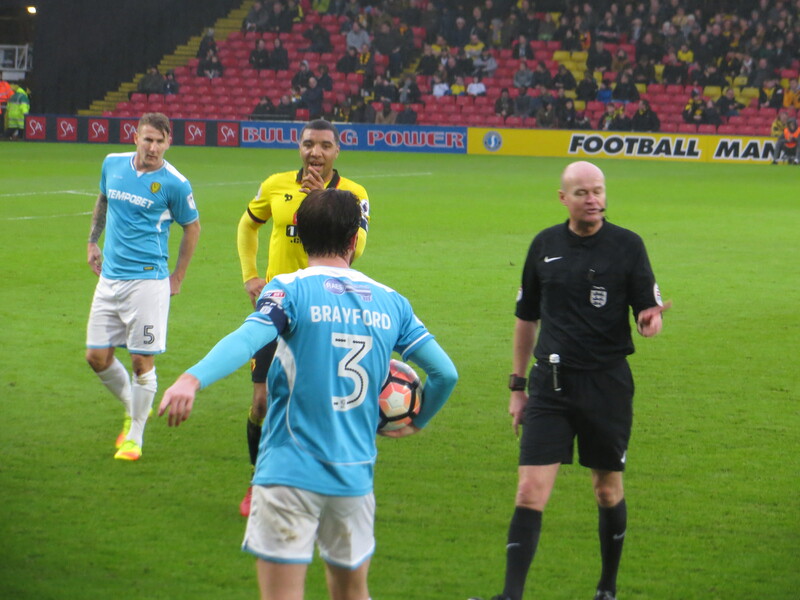 The first card came at the end of the half with Naylor booked for pulling Ighalo back as he tried to escape. There was an atmosphere of satisfaction in the home stands at half time. It was pleasing to have the lead and there had been some good signs, especially going forward. The visitors started the second half well and had the first chance as a Flanagan cross was headed just wide of the target by Varney. Sinclair had a chance with a shot from inside the area, but it was straight at McLaughlin. Another Flanagan cross flew across the face of the goal just missing the outstretched boot of Harness. At the other end, Capoue’s shot from distance flew just wide of the target. 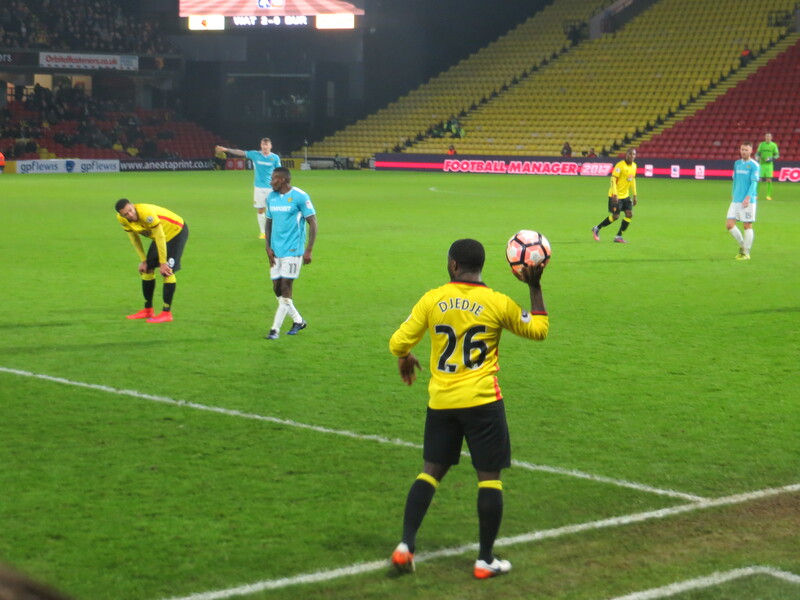 Watford’s second substitution came on the hour as Kaboul was replaced by Brice Dja Djédjé making his first appearance for the Hornets, having been injured since his transfer from Marseille. There was a long stoppage after Varney went down following a clash with Pantilimon. It looked nasty as the Burton man was stretchered off wearing an oxygen mask. I hate to see players carried off, I hope he makes a rapid recovery. He was replaced by Akins. Watford were two goals to the good on 77 minutes as Sinclair went on a run at the Burton defence before unleashing a shot that beat the keeper. The goal was doubly gratifying as it seemed to make the game safe for the Hornets as well as giving an example to some of his team mates just to shoot if you get a sight of goal. 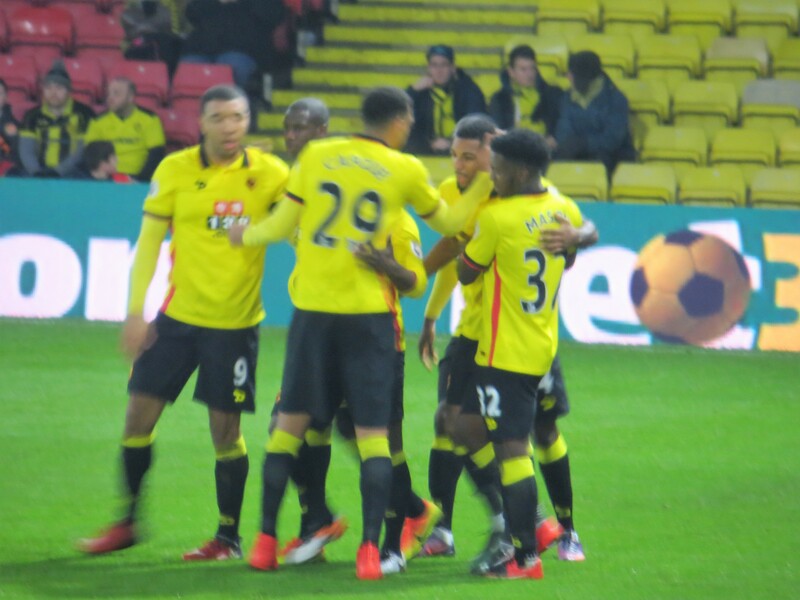 There was a great chance for a third as Capoue played a through ball to Sinclair who found Ighalo running in to the box, he scooped the ball on to his right foot and shot, but it was blocked by the keeper’s legs. Watford had another decent chance as a corner was cleared to Mason, he played a square ball to Djédjé who shot over the target. Due to the long stoppage for Varney’s injury, there were 8 minutes of time added on, which gave Sinclair a chance to go on another run towards goal but this time McLaughlin was equal to his strike. There was just time to give youngster Carl Stewart a debut as he replaced Sinclair after what seemed like an age waiting for a break in the game. He is the 60th player from the Watford Academy to make an appearance for the first team (the third in the past week). The final whistle went on a very pleasing win for the Hornets as, while Burton had their moments, it had been a comfortable afternoon. Mason certainly took his chance, with some great runs down the wing and was clearly delighted with his assist. I hope that we see a lot more of him. Doucouré had another good game in the midfield and Capoue had his best game for some time. Sinclair played well and was clearly buoyed by his goal and our first sight of Djédjé was very promising indeed. After weeks of doom and gloom, it was lovely to have a post-match discussion with so many positives to reflect on. Next week’s visit by Middlesbrough will be very interesting indeed. This entry was posted in Watford FC and tagged Abdoulaye Doucoure, Brandon Mason, Brice Dja Djedje, Burton Albion FC, Carl Stewart, Christian Kabasele, Costel Pantilimon, Craig Cathcart, Etienne Capoue, Jamie Ward, Jerome Sinclair, John Brayford, Jon McLaughlin, Kyle McFadzean, Lee Williamson, LLoyd Dyer, Lucas Akins, Luke Murphy, Luke Varney, Matty Palmer, Miguel Britos, Nigel Clough, Odion Ighalo, Sebastian Prodl, Tom Flanagan, Tom Naylor, Troy Deeney, Walter Mazzarri, Watford FC, Will Miller, Younes Kaboul on January 8, 2017 by franelynn.